Money Flow Index (MFI) is a measure of buyer enthusiasm and can be applied to assets where price and volume data is available. The MFI warns if there is too much or too little volume associated with a security. When buyer enthusiasm is low the likelihood of a reversal bottom is high. When buyer enthusiasm is high, the probability for a top increases. The MFI is a momentum indicator which measures the strength of money going in and out of an asset and can be used to predict a trend reversal. The MFI is calculated over a defined time period, typically 14 periods, as the similar Relative Strength Index (RSI). The MFI measures the relationship between positive and negative money flow. Positive money flow is calculated by multiplying a gain in the typical price by the volume traded that day, negative money flow is similarly calculated when there is a loss in typical price; typical price is calculated as the average of the high, low and closing price for the day. Positive and negative money flow is summed and the ratio calculated for the look back period. The ratio is converted to an index value which oscillates between zero and 100. When MFI drops to 20 or lower it is considered oversold (low buyer enthusiasm), and at 80 or higher is overbought (high buyer enthusiasm). 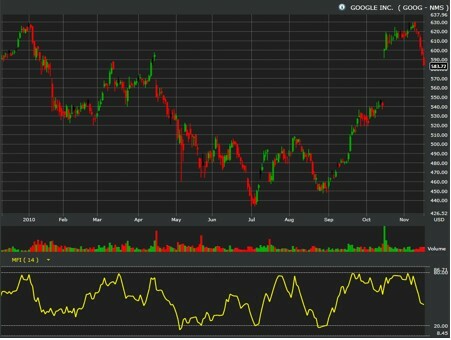 The Google chart above shows how low buyer enthusiasm in May, July and August of 2010 provided the groundwork for the September rally. As with the RSI, strong periods of trending action can extend overbought or oversold conditions. The simplest signals involve moves out of oversold or overbought conditions. A push out of an oversold condition occurs when the MFI crosses above 20 and can be used as a buy / cover signal. A drop out of an overbought condition occurs when the MFI crosses below 80 and can be used as a sell / short signal. When the MFI fluctuates around 50 it typically marks a range bound (non -trending) price behaviour. As a momentum oscillator, divergences between MFI and price peaks can be as important – if not more so – than moves in and out of oversold and overbought conditions. Because volume is a factor in the MFI calculation the pattern of oscillation can be more distinct than its price-only RSI relative. As with RSI, you can have “bullish divergences” where falling price action generates a series of lower lows as MFI makes corresponding higher lows, and “bearish divergences” where rising prices create a series of higher highs but the MFI posts a series of lower highs. The similarly related “positive divergence” and “negative divergence” can also occur. In the former the MFI makes a lower low as price makes a higher low emerging from a downtrend (buy signal). In the latter, MFI makes a higher high as price posts a lower high in a price rally (sell signal). However, as with cases of divergence with the RSI, divergences in the MFI can last months before price action eventually shifts. It’s important to configure the MFI to suit your trading style. Investors with a long term outlook might want to use an MFI set at 30, a swing trader may prefer the default 14 period, while a day trader might instead opt for a 5 period. As with any oscillator, changing the period will also change the overbought and oversold boundaries. A longer period will smooth the oscillation and narrow the range between peak and trough. In the case of an MFI set at a 30 day period, an oversold condition would emerge on a drop below 30 and an overbought one on a push above 70. The MFI works better for signal entry than exit, and is often combined with a trend indicator. For example, buy on an MFI cross above 20 and exit on a price break of the 20-day MA.